For those of us who suffer from motion sickness, the prospect of driving, flying or even boating is usually one that elicits a sense of fear or trepidation. And a long trip filled with nausea, vomiting and dizziness is definitely not what the doctor ordered. Motion sickness is estimated to affect between 15 and 25 percent of the population, making it a highly prevalent (and highly unpleasant) condition. Motion sickness occurs when your physical sense of movement and your visual perception of movement are at odds. A classic example is when you’re reading a book or looking at your phone as you’re being driven in a car. Your muscles and inner ear sense movement as the car rounds bends and goes over bumps, but your eyes only register a stationary book or screen. The result is a miscommunication in the vestibular system — essentially a conflict of the senses. It’s this conflict that elicits those unpleasant, often debilitating symptoms of nausea, vomiting and feeling like the world has it in for you. Not only that, research now shows that video games and virtual reality devices can also contribute to motion sickness in a large proportion of the population, making your chances of getting motion sickness a whole lot more likely. This means that, if you travel regularly, use flight simulators or have a penchant for video games, learning how to prevent and treat motion sickness should be a top priority. In this post, we’ll explore the best ways to prevent motion sickness in the first place, and what to do to naturally treat motion sickness when it hits. Obviously, you want to avoid getting motion sickness in the first place. And fortunately, there are certain things you can do that can significantly lower your chances of having to deal with it during a trip. First of all, reducing that sensory conflict is the name of the game. If you’re in a vehicle or boat, avoid focusing on anything inside. Books, phone or movies are especially off limits! Even closing your eyes doesn’t help, as studies show that blind people are just susceptible to motion sickness as sighted individuals with their eyes closed. Instead, focus on the road or horizon ahead. Doing so helps to align the sense of motion in your muscles and inner ear with what you’re actually seeing, helping to minimize confusion and avoid development of motion sickness. Looking out of side windows at objects whizzing by will only make your symptoms worse, so if necessary request that you sit in the front seat or at least in the middle back seat. Unfortunately, sitting in the front seat isn’t really an option if you suffer from motion sickness while flying. In this case, your best course of action is to ensure there’s plenty of cool air being blown onto your face, and make a point of breathing slowly and deeply. All that breathing is going to dehydrate you fast, so be sure to drink plenty of water! In addition, choosing where you sit on the aircraft can make a big difference to your risk of motion sickness — sitting in the middle over the wing is the calmest spot on the plane, while the front and back of the plane will experience the most variation in movement. Whether you travel by land, sea or air, what you eat before and during travel can also contribute to motion sickness. Where possible, avoid eating heavy, spicy or particularly fatty foods as these can make many people more prone to motion sickness. Alcohol is also a definite no-no, so say thanks but no thanks to the flight attendant when she offers you an alcoholic beverage on the plane. The drinks can wait till you land! There are plenty of prescription medications you can take to treat your motion sickness, but you really don’t want to be resorting to these unless the motion sickness is utterly unbearable or life-threatening. 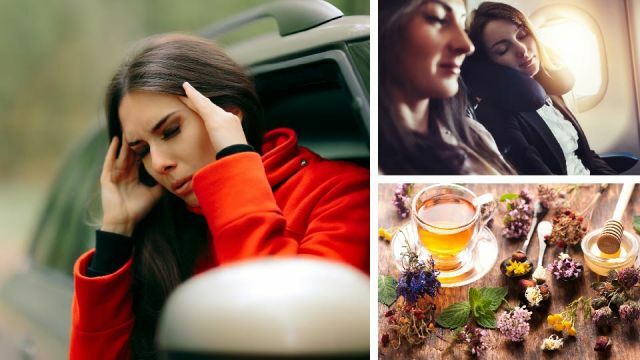 Drugs like scopolamine and certain antihistamines are the most commonly prescribed treatments for treating motion sickness, but these can also cause drowsiness, blurred vision, dizziness and dry mouth. Here are some effective natural motion sickness remedies to try instead. While peppermint has received less attention than ginger in the treatment of motion sickness, it has been shown to effectively treat a major component of motion sickness: nausea. In a 2011 study, peppermint aromatherapy helped to lower postoperative nausea levels more than either the standard treatment or placebo. Another great herbal remedy for treating motion sickness is chamomile tea. Research shows that chamomile contains several terpenoids and flavonoids that make it a highly medicinal plant, and one that can lower feelings of nausea and gastrointestinal upset associated with motion sickness. Make yourself a strong cup of chamomile both before and after a trip (but probably not during!) to keep your motion sickness at bay. Both acupuncture and acupressure have long been used to treat nausea, and more recently acupressure bands have been shown to significantly reduce symptoms of motion sickness. In one study, 25 healthy subjects prone to motion sickness were placed in a rotating apparatus designed to bring on their symptoms while wearing acupressure bands on their wrists or arms. After repeating the experiment with and without the acupressure bands, the results showed that symptoms of motion sickness were far fewer and less severe when wearing the bands. Even if they only make a small difference, these acupressure bands are cheap and easy to integrate into your travels… so why wouldn’t you? Do you have any other natural remedies for motion sickness? Let us know in the comments below! Hey Buddy!, I found this information for you: "Motion Sickness: How To Prevent It, Plus 4 Natural Remedies". Here is the website link: https://www.thealternativedaily.com/how-to-prevent-motion-sickness-plus-four-natural-remedies/. Thank you.